We offer a broad range of training programmes ranging from leadership training and team development programmes through to the facilitation of meetings. Underpinning many of our programmes is the belief that an effective employee is someone who has the capability to influence clients, colleagues, subordinates and suppliers. 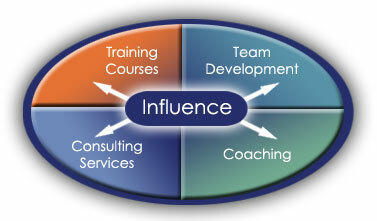 Recent research into the effect of influence has indicated that this is potentially the most vital quality of an effective leader or manager. Our courses are all adapted to the needs of the individual client but we have attempted on this website to outline some of the key content and benefits applicable to each course. We would of course be delighted to discuss any of these courses with you in more detail.